I am sure some have read the last couple of days blog posts and are beginning to question my sanity or perhaps it is just the same doubts that start to rise up when my mindset begins to contradict the way of the culture or when I begin to try and use the gifts I know He has given me to encourage others. Either way, I cling to the hope that this world is not my home and the more times I step out my comfort zone and share the good news of the gospel to encourage those around me, it makes me all the more confident that I am NOT normal to this worlds standards…and that is okay with me. I found myself having to go to the Dollar Store to pick up a couple of things and my mind immediately thought about the index cards…which one did the Lord want me to leave behind? Who would He want me to leave it with? I pulled into a parking spot, but instead of trying to get a closer spot, I strategically began scoping out all the cars and found myself in the middle of the parking lot, with an old ford mustang with a skull on its dashboard and an American flag drooping from the roof to my right and a brand new jeep wrangler to my left. I kept looking over at the Ford mustang as the skull kept grabbing my attention, but I saw one word in my head…”plain.” “Plain?” I asked to no one and closed my eyes and just prayed for wisdom. I opened my eyes to see the Jeep backing up and realized that helped narrow it down for me. I turned to the Ford and through the drivers seat window I saw the plainest light blue van I have ever seen. This van had no tinted windows, no leather, no roof rack, no power windows, no bling, no nothing, just a plain as they come light blue minivan. There was something that drew me to the plainness of this van that I cannot describe. The van looked as if it had it all together and didn’t need anything to make it stand out, except confirmation that all was going to be okay. 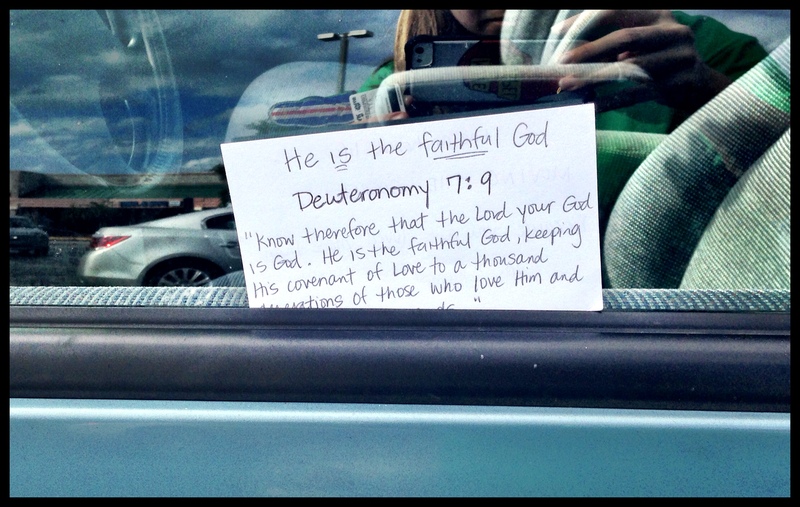 So, with those thoughts in my mind, I looked around the parking lot made sure it was clear of patrons, grabbed the index card He had chosen for this person and slipped it in between the window. I turned around to see someone glance my way in another car, but then act like they didn’t see me. I smiled and just went along my business towards the Dollar Store.